Judy was born on the 8th November 1943 and was introduced to the sport of woodchopping at the age of ten. Her two brothers were competitive axemen and her father spent many hours preparing axes for a large number of competitors, so she was very familiar with the sport from a young age. Judy joined the very first Ladies Committee of the Southern Tasmanian Axemen’s Association (STAA) along with her mother, who managed a catering tent for the axemen and their families. Judy met Arthur Clifford when he joined the STAA. They married and had 5 children. She served as president of STAA and two separate terms at treasurer. 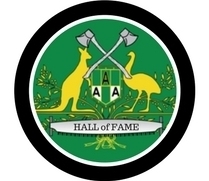 Judy had a few years break from the committee, and is currently president, Patron and Promotions Officer and she was awarded the Axemen’s certificate of Merit and Axeperson of the year 1998.